For a good reason Nova Scotia is known as Canada's Ocean Playground. For many Nova Scotians the sea is main part of their lives - either to make a living or for recreation. The coastline stretches for 7,400 kilometres and is indented by thousands of bays and inlets. The coast is dotted by more than 3,800 islands. 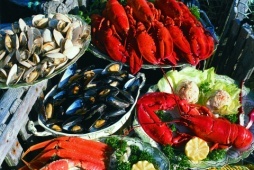 Due to the influence of the sea the climate is mild, summers are comfortable and fall pleasant. There are many things to do in Nova Scotia. Parks, hiking trails, lakes, streams, waterfalls and wildlife sanctuaries are a paradise for nature enthusiasts. Sailing, cycling, river rafting, kayaking and canoeing to name just a few activities the province of Nova Scotia has to offer. This is completed by entertainment, culture, historic sites and of course fine dining. The Highlands National Park contains one of the world's most spectacular driving route. Kejimkujik National Park is a true jewel for outdoor friends. Explore the many lakes and islands on a canoe tour and camp on uninhabited islands. White sandy beaches can be found on the eastern shore. 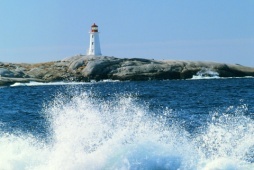 Visit world famous Peggy's Cove lighthouse, a remnant of early days. Enjoy the world's highest tides on the Bay of Fundy. Golfers will fall in love with this province as they will find some of the most beautiful and challenging courses, such as the Highland Links course in Cape Breton or Digby Pines in Digby. The province of Nova Scotia covers an area of 55,000 sq km. The mainland part of the province is connected to New Brunswick and the remainder of Canada by the 28 km Isthmus of Chignecto. Cape Breton Island is joined to the mainland by the Canso Causeway. Halifax, the capital city is located south of Paris. The coastline stretches for 7,400 km, but the overall length of the province is only 575 km, while the average width is 130 km. In 1998 934,587 people called Nova Scotia their home. This is about 3,1 per cent of the total Canadian population. The province's capital is Halifax. Many of the Micmac people remain on their original lands in Cape Breton. In other areas, French culture and language live on. The majority (approx. 75 per cent) of the province's people are of English, Scottish and Irish decent. In a few places you can still hear Gaelic spoken. The Bay of Fundy ebbs and flows as much as 20 metres each day. The most common way to Nova Scotia is via Halifax by plane. Flights from Europe usually have a stop-over in Montreal or Toronto. Flights are offered by Air Canada and Lufthansa you should compare prices as there are many specials you can benefit from. 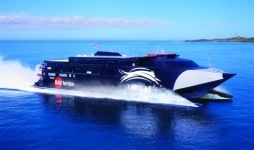 One of the most interesting ways to enter Nova Scotia is by ferry from the surrounding provinces of New Brunswick, Prince Edward Island and Newfoundland. We recommend a rental car or RV as roads are usually in good conditions. For those of you, who intend to discover the more remote areas of the province should consider renting a 4-wheel drive vehicle as gravel roads are fairly common. This applies also to those individuals who consider exploring the wilderness. However you should make up your mind before signing your rental contract as many vehicles may not be used on unpaved roads. This is especially important for RV renters. For the more adventurous traveller a bus ride with Greyhound might be just what you are looking for. The network is broad and prices are reasonable. If you exactly know, where to go you can also take a domestic flight. Most towns have an airport with daily service. Besides the most common credit cards (Visa, Master Card and American Express) you might consider carrying some Traveller's Cheques in Canadian currency and small denominations. Those are generally accepted like cash and have the advantage of being insured. However you should always carry some cash, especially if you intend to push forward to more rural areas. Here cash is the only thing that counts as most of the small shops do not have the equipment to accept credit cards. You should not bring German Marks or American Dollar in order to pay your bills. All prices are generally subject to applicable taxes, which might be uncommon for European travellers. Taxes are added when you pay. Usually you have to pay 15 per cent taxes (HST Harmonized Sales Tax). However some merchandise is tax exempt. Waiters in a restaurant generally require a tip, which is added to the bill's total as they generally receive only minimum wage. It is up to you, how much you leave, but 10-15 per cent is fairly common. Usually you leave the tip on the table as you go. Tip is also given to cabbies, hairdressers, barbers, hotel attendants and bellhops. Usually stores in Nova Scotia are open 10 am to 6 pm. Some might be open till 9 pm and grocery stores often offer a 24 hour service, which also applies to gas stations who regularly have a convenient store attached. In summer months usually longer opening hours apply. The post office generally closes at 5 pm, banks sometimes already at 4 pm. Travelling through Nova Scotia will offer a wide range of outdoor experiences or opportunities. 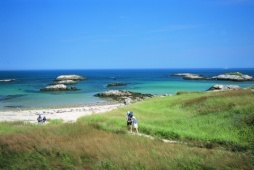 There is a broad network of Provincial Parks in Nova Scotia to explore. You will find many opportunities to enjoy fresh or salt water beaches, camping, hiking or picnicking. There are two National Parks within the borders of Nova Scotia. Those are Cape Breton Highlands National Park and Kejimkujik National Park. For further information on National Parks, please visit our Canada Vacation Planner. For further information on World Heritage Sites, please visit our Canada Vacation Planner. Nova Scotia was named by Sir William Alexander, who received a grant to all the land between New England and Newfoundland from King James VI of Scotland (King James I of England ) in 1621. The official charter was in Latin, and the name, "New Scotland", retained its Latin form - Nova Scotia. When Europeans first arrived in what was to become Nova Scotia, much of the land was inhabited by the Micmac Indians, the dominant people of the Atlantic region. The Micmac were among the first natives to get in contact with Europeans. In the early period of Canadian history the Micmac co-operated with the French. They helped them to adjust and fight against the British. Nova Scotia was first known as Acadia, when the French created the first settlement at Port Royal. The settlement, which was established by Pierre de Monts in 1605 is nowadays known as Annapolis Royal. There was a fight between the French and the British for 100 years, who takes over control of the area. There were no major British communities before 1749, when Halifax was founded. The Germans followed to the Lunenburg area. In 1773 the Scots landed in Cape Breton and thousands more were to come. Lumbering and shipbuilding made Nova Scotia to prosper and coal mines were opened in the 1800s. Nova Scotia was one of the original provinces to join Confederation in 1867. After WW II many people from Europe immigrated to Nova Scotia.